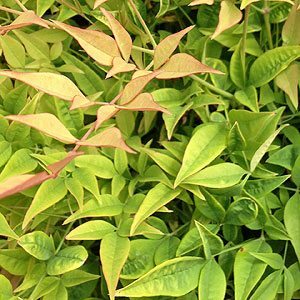 Grown mainly for its foliage Nandina domestica is also know as ‘sacred bamboo’. Originally from Japan this is not actually a bamboo at all, and is not invasive like many bamboos, although it may self seed. Grown for the foliage which is green when new and then turns to red. You will find that the red color is more intense in colder climates. Being a very hardy plant, they can be grown in containers or in the garden, and with both small and taller growing varieties available you can find a type suited to almost any landscaping application. Grown as a low screen, in clumps, as a border plant or as a foliage plant in pots or containers its bamboo like foliage is sometimes accompanied by small flowers followed by white berrys. Nandina domesticas it copes with a range of situations including full sun to shade, poor soil and lack of moisture. N.domestica and its cultivars are widely used when landscaping in difficult situations. Evergreen, but with good autumn color, an excellent choice for a low growing hedging plant in tough positions. and is a tough drought tolerant. These are a particularly low care plant once established. Dig over the soil before planting adding some extra compost if required. Mulch around the new plants to retain some moisture. Fertilise in spring using a general purpose slow release type fertiliser. Over time Nandina will form a large clump that can easily be divided in early spring, it will self seed so remove flower heads before the berries form or look for ‘Gulf Stream’ which does not seem to flower. Light pruning will help keep the plants bushy and compact. Nandina domestica domestica ‘Gulf Stream’ (Moon Bay) is a recent introduction, low growing (around .6m) it seems to be a sterile cultivar as we have not seen it flower. New green foliage turns to a orange to salmon pink. Nandina domestica ‘Blush’ good pink to red foliage for long periods. Plants are readily available for sale from both retail and wholesale nurseries.